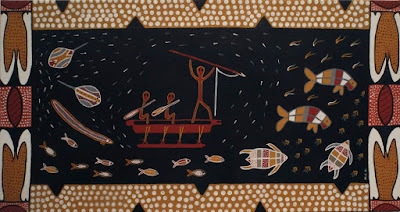 Mereia Anning, Hunting for Dugongs, 2001; acrylic on canvas. Animals cannot live without water; scientists believe that life cannot begin without liquid water. An exhibition at the Hood Museum of Art, Water Ways: Tension and Flow, examines the relationship of water to human life. 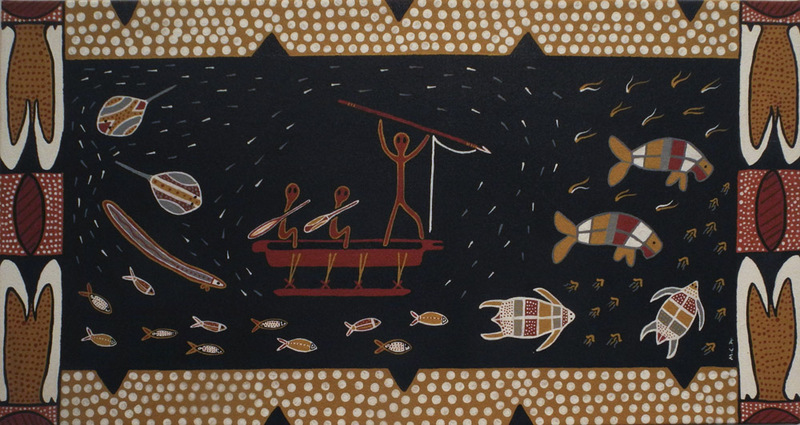 On a wall outside the gallery of photographs, many of monumental size, there is a small painting by an Australian Aboriginal artist showing traditional sustenance coming from the sea: fish, turtles, eel, and dugong (a sea mammal similar to a manatee). How long will our seas and waterways provide us with food if continue on our present path of despoilment? 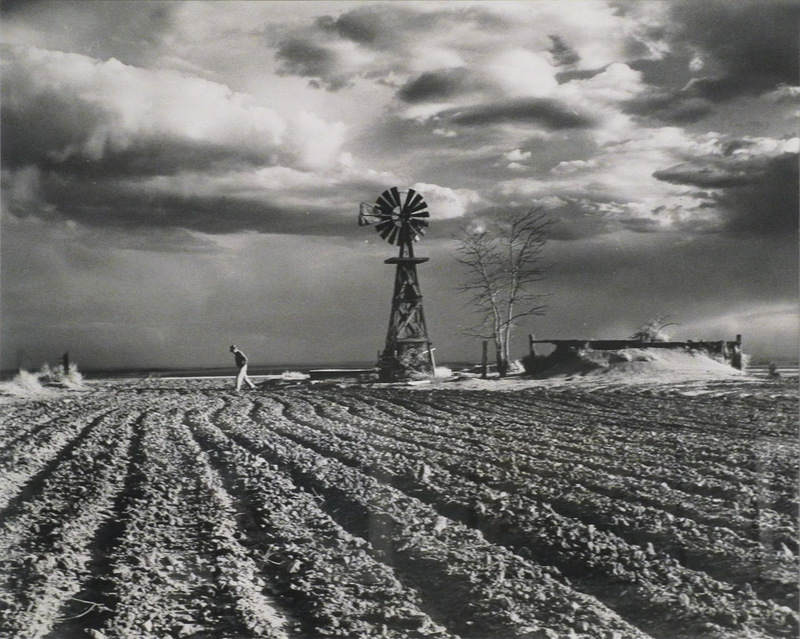 Margaret Bourke White, Dust Bowl––Taken near LaMar, Colorado, 1953; gelatin silver print. Yesterday, when I began working on this post, it was pouring rain. Here in the northeast, rain has been overabundant the past couple of years, while in the western United States there has been a drought of epic proportions. Bourke White's photograph, taken 20 years after the terrible dust storms of the "dirty 30s" shows that we did not learn from the mistakes made earlier. And we still haven't learned, as the Oglalla aquifer sinks and California farms suffer from lack of water. There is a great book by Timothy Egan and documentary by Ken Burns about the Dust Bowl of the 1930s, which I wrote about in this blog post. 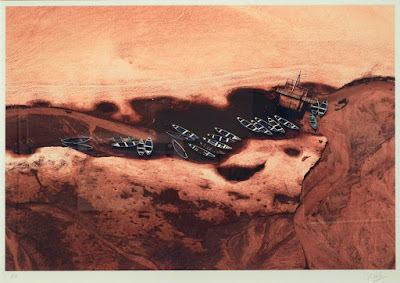 Daniel Beltra, Alter Do Chao, Para (Brasil), from the series Amazon Drought, 2005; pigment print on paper. It is not only in the US that drought has ruined landscapes: the photograph above was taken during a terrible drought in Brazil, where a vast watery region became dry and like a desert. What happens to the inhabitants during such a terrible time? Nici Cumpston, Campsite III, Nookamka Lake III, from the series Attesting, 2008; archival print on canvas, hand colored with pencil and watercolor. While some droughts are caused by natural weather patterns (should people be living in areas prone to drought or flood? ), others, such as the American dustbowl, were caused by human activity. 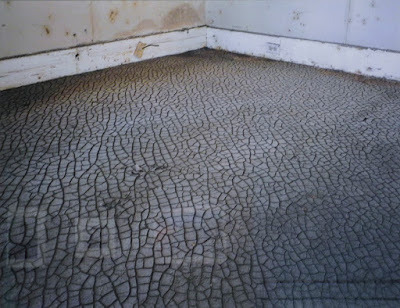 This dramatic work shows the drying out of one of the largest freshwater lakes in Australia. Overconsumption of water from the river that fed this lake is leading to its death. 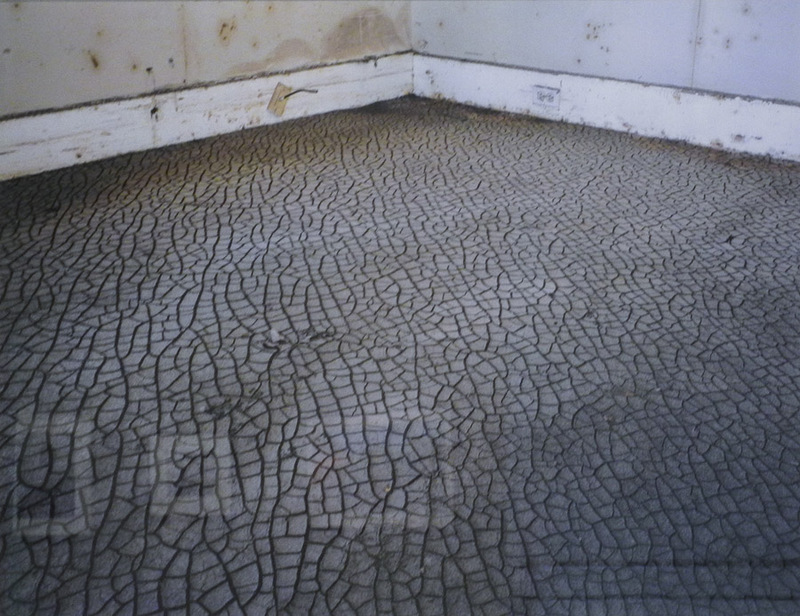 Chris Jordan, Living Room Floor, Ninth Ward, from the series In Katrina's Wake: Portraits of Loss from an Unnatural Disaster, 2005; pigmented inkjet print on paper. The 2005 hurricane season's extraordinary severity can be linked to global warming, which America contributes to in disproportionate measure through our extravagant consumer and industrial practices. Gideon Mendel, Joseph and Endurance Edem, with Their Children, Bayelsa State, Nigeria, 2012, from the series Drowning World; giclee print on paper. This is my house. I was here when the rains began falling. Before we knew it the flood came. There was nothing we could do. I just ran out with me and wife and children. This water has been here for more than a month, with no help from anywhere. Ian The, Kuye River, Yulin, Shaanxi, from the series Traces, 2010; chromogenic print. Due to overmining, the water table has sunk, and the river that was once full is now nearly dry. The city, now wealthy from decades of coal mining, now regularly suffers from water shortages. 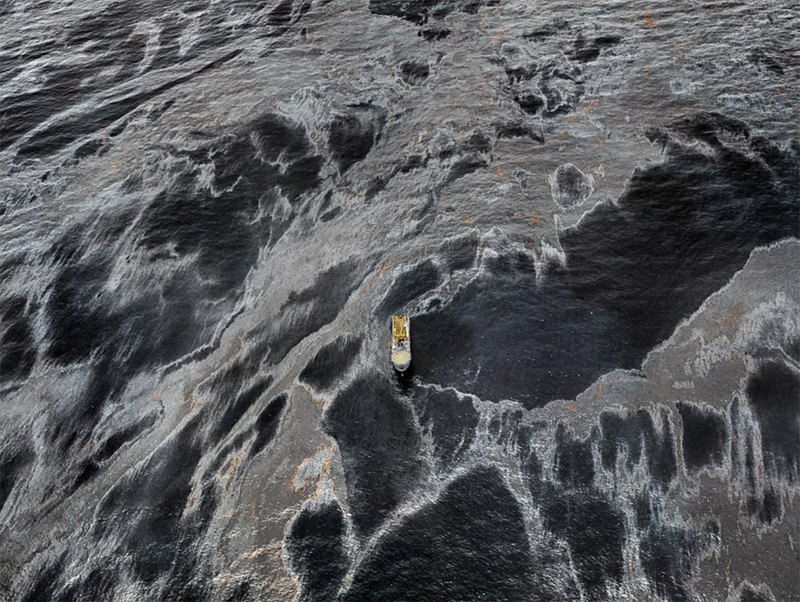 Edward Burtynsky, Oil Spill 1, REM Forza, Gulf of Mexico, 2010; digital chromogenic color photograph. Image courtesy of Edward Burtynsky's website. While trying to accommodate the growing needs of an expanding, and very thirsty civilization, we are reshaping the Earth in colossal ways. In this new and powerful role over the planet, we are also capable of engineering our own demise. We have to learn to think more long-term about the consequences of what we are doing, while we are doing it. 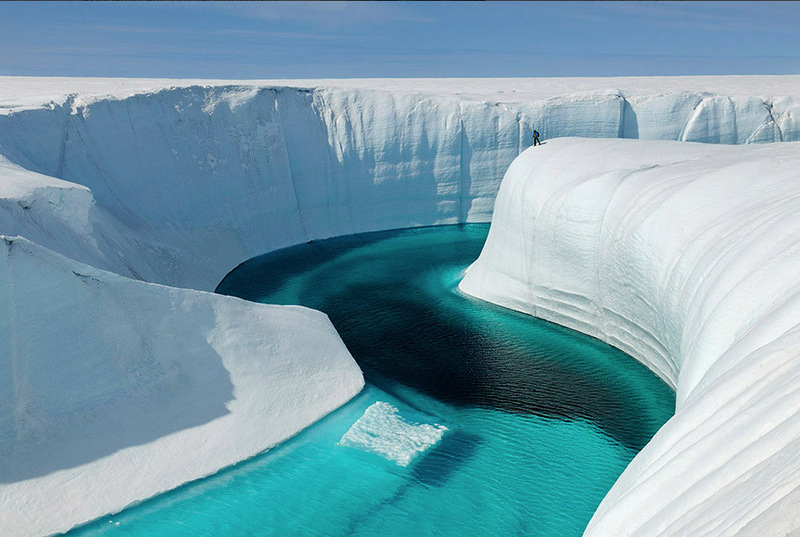 James Balog, Birthday Canyon, Greenland Ice Sheet, from the series Extreme Ice Survey, 2009; chromogenic print. Image courtesy of James Balog's website. James Balog has been documenting the disappearing Arctic ice sheets in a series of gorgeous photographs, and in a powerfully beautiful and frightening documentary Chasing Ice, which I wrote about here; it is available for streaming on Netflix. His project is a very important one; we should all be aware of his work. Altoon Sultan, Well, Rolinda, Central Valley, California, 2001; egg tempera on panel,15 x 17 in. My paintings were not in this exhibition, but I wanted to show them in this post because they are about water. 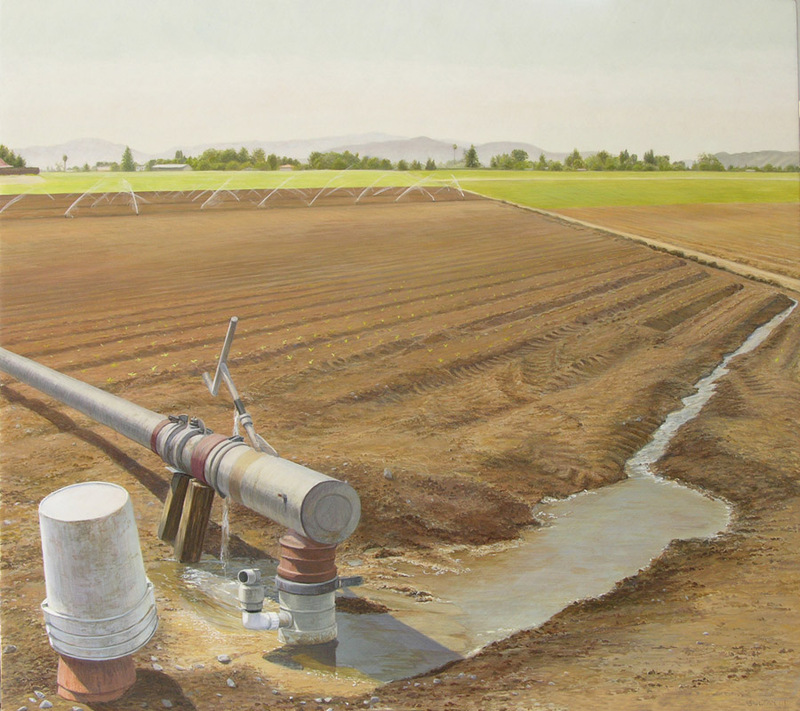 Twenty years ago I taught for three years in California and became aware of how the land was farmed: the bounty of produce coming from there was produced with irrigation and with lots of "inputs" of fertilizers and pesticides and herbicides. Altoon Sultan, Young Pepper Plants, Gilroy, California, 2001; egg tempera on panel, 20 x 22 1/2 in. The water came from far off, carried in concrete canals, or was pumped from groundwater wells, which held less and less each year. 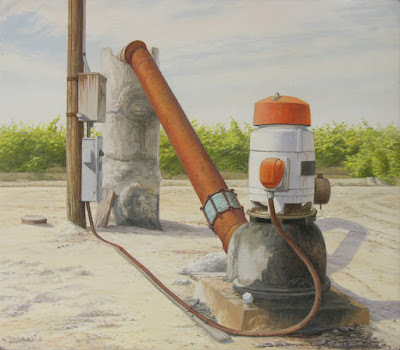 On a visit back to California some years later, I did studies for a series on water. A great book on water in the West, written in 1986 and foreseeing the problems that have now become so extreme, is Cadillac Desert: The American West and its Disappearing Water by Marc Reisner. 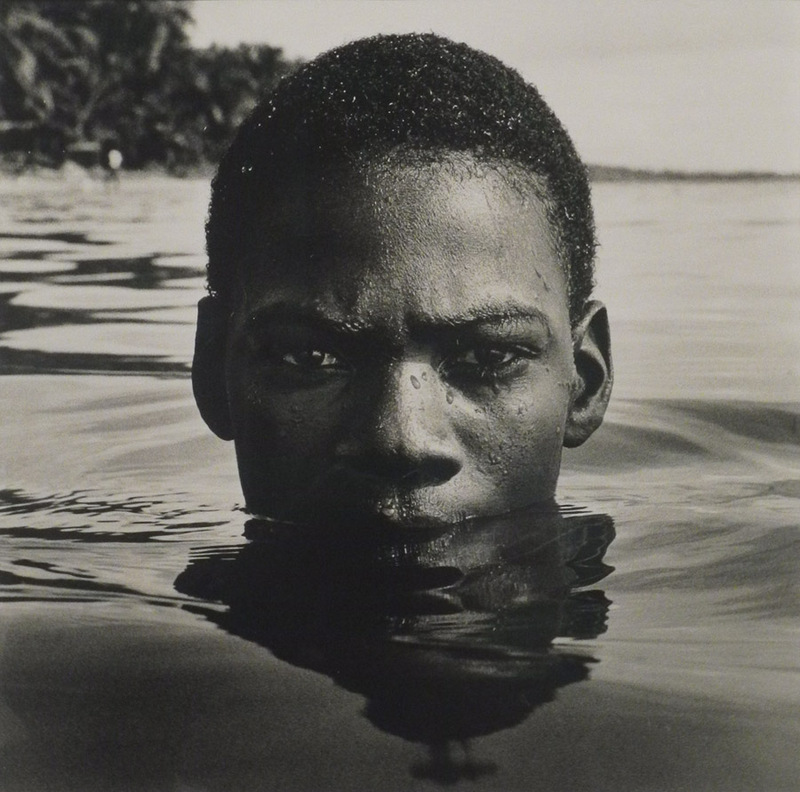 Tony Gleaton, A Son of Yemayá, Hopkins, Belize, from the series Tengo Casi 500 Años: Africa's Legacy in Central America, 1992; gelatin silver print. We are immersed in water, we are water. According to the USGS, the brains and heart are 73% water, the lungs 83%; even the bones are 31% water. Yemayá is a mother spirit in Yoruba mythology, a "patron spirit of women, and the mother of all living things. She is often shown rising from the water or as the owner of all water." (from the wall label) May she protect us from ourselves. Thank you, Altoon, for this stirring post. I'm so glad the post touched a chord for you, Ravenna. 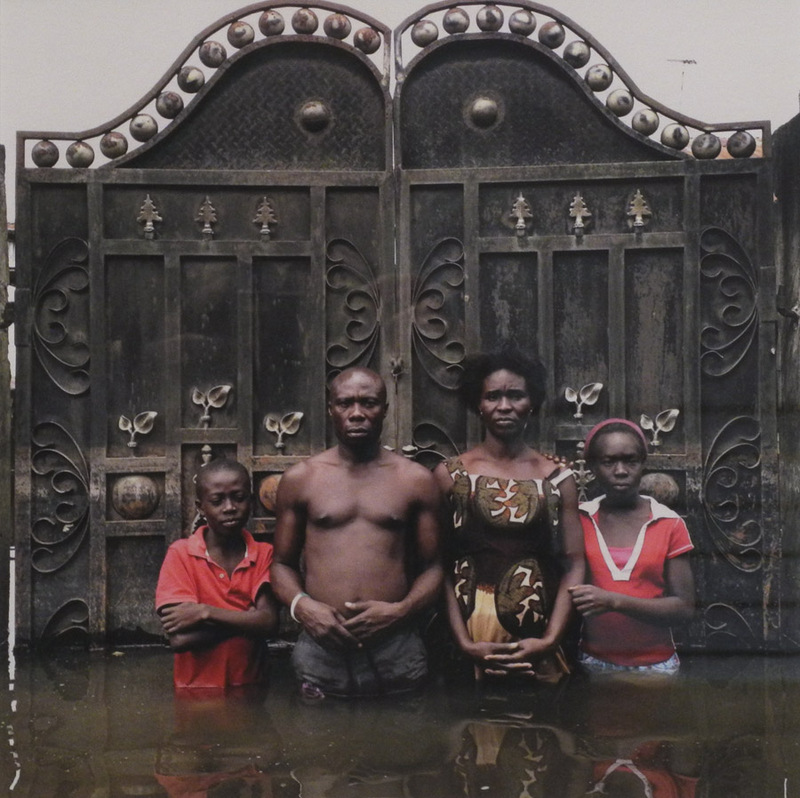 We are lucky that these artists document the devastation across the globe. I don't know the Eliasson sculpture. You are very welcome to share this post, Jennifer, as long as my name and the url of the blog are clearly noted. Your project looks really terrific; congratulations on your effort's success. A New Painting: "Rectangles and Cylinder"